Philadelphia's Fairmount Park system is one that I feel gets a lot of bad rap. Sure some of the park areas don't seem too safe after the sun sinks below the horizon, but almost all parks have an element of danger after dark (especially when the park is the only open space in a large urban environment). But given a nice sunny day and agreeable companions, a trot through most parts of Fairmount Park can prove enjoyable. One recent weekend, a couple of friends and I planned part of our fun day around Fairmount Park off Lincoln Drive. We had a nice picnic lunch and even a brisk walk through some woods (though some of my compatriots were not big on a sporadic hike due to the staunch heat). All in all, a pleasant time. But after a bit of time outside amidst the natural, we decided to go seek out some coffee at a little known (at least to me) place called the High Point Cafe in the Mt. Airy region off Lincoln Drive. The coffeehouse sits amidst a cute little downtown complete with a co-op, bookstore, and environmental design shop. The tiny exterior of High Point stands welcoming with its red and green colors, decent outside seating, and overall clean design. Within the venue, the coffeehouse looks long with a fair amount of seating towards the front but mostly room for the line where the counter imposes. The animal art on the wall and the calm decor of orange and turquoise breathed a relaxing yet industrious environment. The coffee comes mostly from True North, a coffee roaster out of Seattle, though they also serve a few Equal Exchange coffees (bleh). That day, I had a 3 bean robusta (True North) that tasted a bit dark but also had hints of caramel and a nice acidity; overall, a decent coffee. The espresso seemed to be a strength, as the barista definitely knew her coffee and definitely pulled a decent doubleshot, with nice crema and a bright chocolaty sweetness. The teas were free leaf and they also had a very alluring menu. 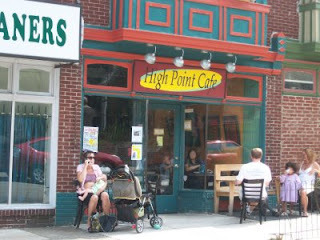 After sitting for a while, my friends and I headed out to play some chip and putt, but before we left one of my buddies mentioned that High Point was a good choice for the coffee stop. I have to say I agree (though I think if they tried a little harder, they could really reach their high point). If you're in the area, make sure to drop in. Whats up intelligent points.. now why didn't i think of these? Off subject slightly, is this page pattern merely from an unusual installation or else do you employ a customized template. I take advantage of a webpage i’m looking for to enhance and properly the visuals is probably going one of the key things to complete on my list. Very efficiently written information. It will likely be useful to anyone who usess it, including myself. Sustain the good work – for certain i'll check out more posts.